The Natural Resources Conservation Service (NRCS), an agency of the U.S. Department of Agriculture (USDA), administers this program. NRCS provides technical and financial assistance to landowners wanting to enhance, restore or protect wetlands. Easement payments and restoration costs vary depending on whether land is cleared or forested and whether an easement is permanent or not. Per-acre payments to landowners also vary by state and county or parish. NRCS also pays up to 100 percent of restoration costs. To enroll land in a wetland reserve easement, landowners can apply through local USDA Service Centers. The Farm Service Agency (FSA), an agency of the USDA, administers this program. Landowners receive yearly rental payments, based on soil types, in exchange for agreeing to remove environmentally sensitive land from agricultural production and establish plant cover that will improve environmental health and quality. Contracts for land enrolled are usually for 10 to 15 years. The programs goals are to improve water quality, prevent soil erosion and reduce loss of wildlife habitat. A variety of land types can be enrolled, including bottomland hardwood forests, longleaf pine forests, waterfowl habitat, upland bird habitat, floodplain wetlands, highly erodible land and others. Landowners can enroll through local FSA Service Center. NRCS administers this program to help agricultural producers and others implement conservation practices on working lands. Eligible land includes cropland, rangeland, pastures and forests. Socially disadvantaged farmers and ranchers; beginning or limited resource farmers and ranchers; and military veterans may be eligible for enhanced or advance payments. Goals of the program include water pollution reduction, water conservation, erosion reduction, promotion of habitat for at-risk wildlife and carbon sequestration. Payments to landowners can be up to 100 percent of the cost of planning and implementing conservation practices. Landowners can apply through local USDA Service Centers. NRCS administers this program to encourage agricultural producers and other landowners to maintain and improve existing conservation practices and implement new practices. Participants receive an annual land use payment for operation-level environmental benefits they produce. Payments rise as conservation results increase. 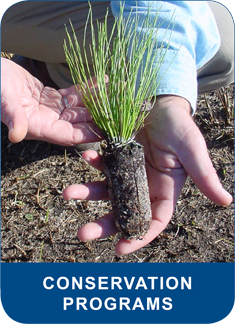 Numerous types of conservation practices are encouraged, including those to protect water quality; enhance wetlands or grasslands; establish riparian forest buffers; establish waterfowl or shorebird habitat; improve wildlife habitat through controlled burning; and establish pollinator or beneficial insect populations. Landowners can apply through USDA Service Centers. A conservation easement is a restriction a landowner voluntarily places on specified uses of his or her property to protect natural, productive or cultural features. A conservation easement is recorded as a written legal agreement between the landowner and the holder of the easement, which may be either a nonprofit conservation organization or a government agency. In Lower Mississippi River region, conservation easements are usually donated to nonprofit conservation organizations, commonly known as land trusts. 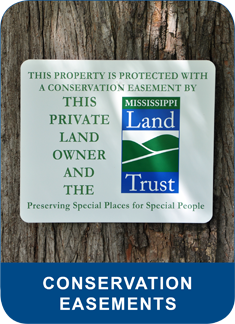 The Mississippi Land Trust works with landowners in the state of Mississippi to establish conservation easements. The Mississippi River Trust, a sister organization, establishes conservation easements in the rest of the Lower Mississippi River region. Websites for both organizations provide detailed information about conservation easements. While easements can provide substantial federal tax benefits, the attempt to obtain a tax benefit should never be the primary reason for granting a conservation easement. Landowners interested in conservation usually have two principal concerns. First is the desire to protect the natural or productive qualities of their property. The landowner is interested in conserving special features such as fertile soil, mature trees, wildlife habitat or a piece of history even after his or her ownership comes to an end. Secondly, landowners must also contend with the increasing tax burden associated with property ownership. Estate taxes, property taxes and the financial incentive to sell or develop are all factors that affect land use decisions. The economics associated with land ownership are changing and fewer family-owned properties are the primary source of a family’s income. The Land Trust Alliance , a national organization, has prepared a brochure on conservation easement tax incentives for private landowners. View or download the brochure here. After conservation easements are established, landowners retain control of access to their property. They may choose to allow access to specific groups or the general public in a conservation easement agreement, but landowners are not required to do so. Also, property with a conservation easement can be bought, sold and inherited. However, the conservation easement is tied to the land and binds all present and future owners to its terms and restrictions. 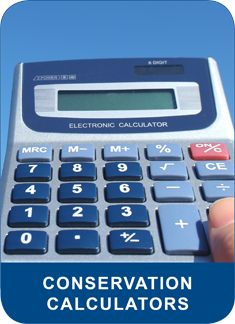 The Conservation Finance Center has two financial calculators. One allows users to compare income and tax implications of continuing current land uses, such as farming, to enrolling land in the Conservation Reserve Program. The other allows users to compare income and tax implications of continuing current land uses, such as farming, to enrolling land in a Wetland Reserve Easement. The calculators ask users to enter various types of information, such as the length of an easement, restoration costs, whether a user will have additional revenue from hunting leases, size of the property and net income from current land use. With the Conservation Reserve Program calculator, it is best to consult your local Farm Service Agency office to determine the soil rental rate for your property. Otherwise, you must use a county average, which may not reflect actual payments for your property. With the Wetland Reserve Easement calculator, you must enter the per-acre payment offered in your county and state, found in linked maps or charts on the calculator page. It is best the contact your local Natural Resources Conservation Service office before using the calculator. Local offices can help you determine the per-acre payment for which you may qualify, based on whether your property is cleared land or not. The Conservation Finance Center is an information resource for private landowners. It is a cooperative effort of Wildlife Mississippi, the Mississippi Land Trust and the Mississippi River Trust. The Walton Family Foundation and the Yale School of Forestry assisted in the development of this website and the financial calculators. The financial calculators were developed for use by private landowners throughout the Lower Mississippi River Valley, or those living in Arkansas, Kentucky, Louisiana, Mississippi, Missouri and Tennessee. Information about conservation programs applies to the region and the entire United States. If you have questions about the Conservation Finance Center, please contact the Stoneville, Mississippi, office of Wildlife Mississippi at (662) 686-3375. For questions about Farm Bill programs, you may email James Cummins, Executive Director of Wildlife Mississippi, at jcummins@wildlifemiss.org. For questions about conservation easements, please email Brian Ballinger, at bballinger@wildlifemiss.org. The Conservation Finance Center is a cooperative effort of Wildlife Mississippi, the Mississippi Land Trust and the Mississippi River Trust. The Walton Family Foundation and the Yale School of Forestry assisted in the development of this website and the Conservation Calculators.